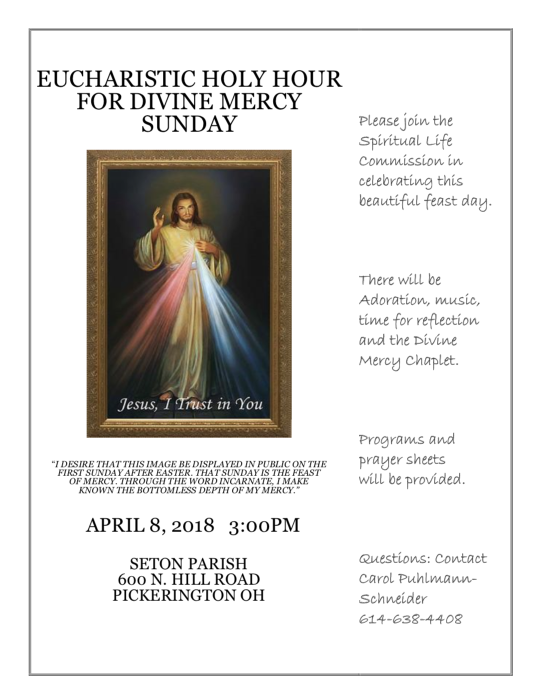 This Sunday, April 8 at 3:00 p.m. you are personally invited to a Eucharistic Holy Hour in celebration of Divine Mercy Sunday. In 1930, St. Faustina began recording her visions from Christ that His Mercy should be felt in a very substantial way in the hearts of many. Based on instructions from Jesus, she commissioned the famous painting you may have seen that depicts red and white light radiating from Christ's heart. Pope John Paul II felt so strongly about this message that he instituted this feast day on the second Sunday of Easter beginning in the year 2000. This Sunday at 3:00 p.m. will be a very beautiful hour of music, reflection, Eucharistic Adoration, and prayer. If you have been searching for a way to deepen your faith or if you are struggling to forgive yourself or others, please join us. This hour will open your heart to the mercy and forgiveness that Christ wants to pour into you.